Terry Adkins, Prototype Monument for Center Square (2015). Mural Arts Philadelphia has announced the roster of artists who will bring bursts of creativity to the city this fall through their participation in Monument Lab, a pop-up public art and history installation. The 22 artists, most notably world-renowned Chinese artist and activist Ai Weiwei, will bring temporary works to 10 parks and squares throughout the city from Sept. 16 to Nov. 19. The locations include City Hall, Franklin Square, Washington Square, Logan Circle, Rittenhouse Square, Penn Treaty Park, Vernon Park, Norris Square Park, Malcolm X Park and Marconi Plaza, along with a central hub at the Pennsylvania Academy of the Fine Arts. According to Mural Arts, the installation will focus on the topic, “What makes a monument in the 21st Century?" which has inspired planned pieces on immigration, opioid addiction and gentrification. 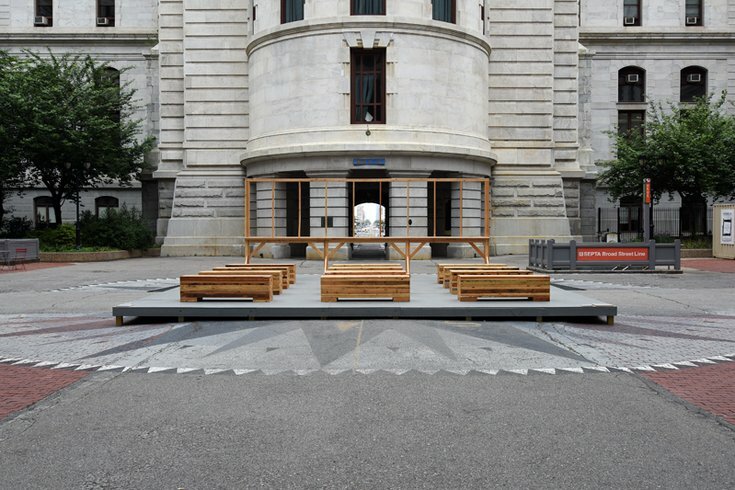 Also part of the installation will be interactive pop-up “laboratories” meant to inspire creative conversations and engage visitors to come up with proposals for future Philadelphia monuments. Programs and tours will also be held at the pop-up spots over the exhibition timeframe. Read more on Monument Lab's upcoming exhibition here.